Easily Send, Receive and Own Bitcoin privately, worldwide. Download the app that is changing the way the world owns and moves money. No name, no ID, no bank, no intermediary. No problem. Bitcoin as easy as your number. Finally, anyone can use Bitcoin! 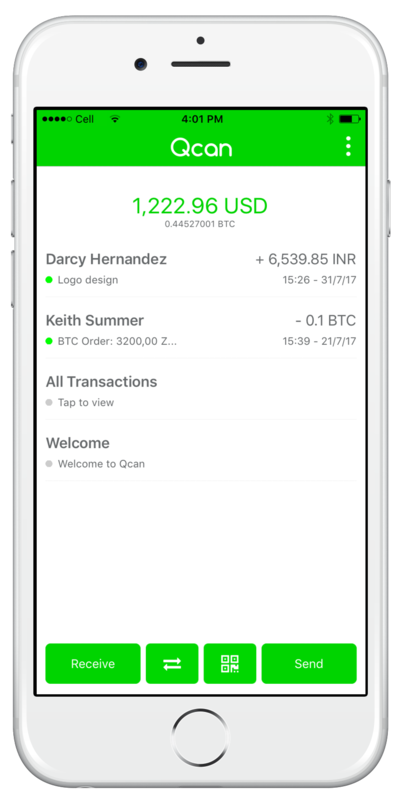 Qcan transforms your mobile number into an instant Bitcoin wallet that’s easy to use, secure and private. Best of all, you keep 100% control and ownership of your money at all times. Easily send Bitcoin payments to mobile numbers in your contacts without asking for a Bitcoin address. Easily receive Bitcoin payments from anyone that has your number without sending a Bitcoin address. Accept payments for services across borders with no merchant fees or payment limits. Request Bitcoin payments from contacts and clients in their preferred currency or yours. Store your Bitcoin safely and select from over 100 currencies to monitor your current balance. Qcan places no restrictions on your transactions so you can transact freely, after all it’s Your money. Transfer money worldwide. Use Qcan to send and receive payments to and from any country. Cash in and out of Bitcoin into any currency you choose anywhere in the world. Easily scan and pay QR Codes from online and offline merchants anywhere, worldwide, without converting your funds into local currency. Send and collect payments around the world while you are on the move, never miss a payment even while you are unreachable. Qcan is the first service of its kind to introduce the direct payment of bitcoin to mobile numbers. Qcan is available worldwide, making it easy for anyone, anywhere to send, receive and own Bitcoin easily across borders without permission from anyone.